The Buenos Aires Toy Museum, Argentina Museum/ Art Gallery/ Real Estate Development in Villa Devoto and Ser Dueno de un Museo es posible Villa Tulumba Bob Frassinetti, Entrepreneur in the World of art, art collecting and international antiques trader dealer as well as free lance journalist from Argentina, Buenos Aires, working on the web, writing both for pleasure and work on art, antiques and collectibles, in and on Buenos Aires, Argentina as well are neighbouring countries, Chile and Uruguay. "I've written for several Travel Adventure, Art & Antiques Magazines on and off the web and have researched Toys made here in Argentina, as well as Travel Adventure from Route 40 and Lighthouse Adventures along the Atlantic and Pacific coast, following like always the Dakar Rally from 2009,..
............ in Real Estate we are the first on to House Boats, with our project, Art + River Side Land = House Building Ideas, developing a plan for the Rivers and Lakes of Argentina a s well as the Delta Area next door to Buenos Aires, Capital City of the fascinating south of South America Country! Travelling for Art and Antiques" in all South America and I have been on line since 1996 . Multiculturalism: My own Point of View. The Early Years. I also lived for many years in England. My teen years and a bit more I spent them at Mount St. Mary’s College in Spinkhill, a small town near Sheffield in the English Midlands. This Jesuit boarding school was my home; my classmates were my family and some of the finest memories date from those years… I also travelled in the Bahamas, and back in those days one of my friends’ had a small mansion by the sea side, where I spent several summers there, and once a group of 4 chaps, young, loud, and amazingly famous stayed there while touring and making a movie called, “Help” … their names were John, Paul, Ringo and George. Yes, The Beatles, so I also got to know them. It was the 70s and England was bursting with enthusiasm, creativity and wittiness. I’m happy to know I witnessed those amazing times. I have no doubt about the fact that those early experiences in my life have shaped my mind, my soul and my interests, that today I see taking shape and body in the broad cultural project I develop passionately every day. As Latin as I am, thanks to my Pop’s influence, I feel deeply passionate about art, style, culture… As a Brit as I have come to be, I feel English is my mother tongue, the borderless language that allows us individuals to transcend geographical borders and limits, the language of my thoughts and my chats… Thanks to my lifetime experiences I’ve become who I am, and along the way many of my projects, those that start in one’s mind and come to take shape along the road of life, began to be real and my input in this modern global world. I’m a proud citizen of the world, who has chosen Buenos Aires has become home, and all of South America as my back yard. The Happy 90's. Early days of the Internet. Argentina also exports antiques over 100 years old with the help of Bob Frassinetti Read all about the South of South Amerca, Argentina, chile and Uruguay on this link. The Buenos Aires Toy Museum. Created in 1996 and On Line since. Toy Museum from Argentina. Created in 1996 and still on line from Argentina. Bob Frassinetti. Copyright 2005.Updated 2010 Roberto Dario Frassinetti. .
Good news to all our readers and friends! Lonely planet’s latest 4 th edition has come out and as recommended tourist services ours’ is listed. We’re very happy about the listing and we hope this is a good tip for travellers coming to Buenos Aires –or any other Argentine location-… As we’ve been doing so far, we’ll share our insider’s point of view, tips and all information the visitor might need… And for those who want more, we also offer a customized tourist service, specially tailored to fit each and every one’s needs of interest and passion. Argentina also exports antiques over 100 years old with the help of Bob Frassinetti Read all about the South of South America, Argentina, Chile and Uruguay on this link. Chat some more soon, ................................ Bob Frassinetti. Bob Frassinetti in the News! Bob Frassinetti. Copyright 2005. Updated 2010 Roberto Dario Frassinetti. Argentina. Bob Frassinetti, the man without a childhood......... Don Frazinetti,el Hombre que no tuvo infancia. Agosto 3 Buenos Aires. 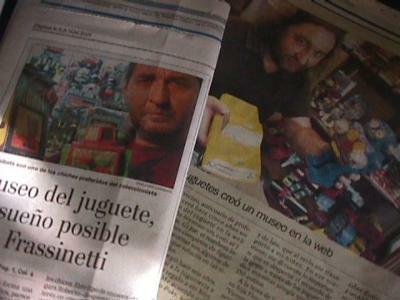 “The biggest collector of Argentine toys: Mr. Frassinetti, the man without childhood”, reads the headline in the latest Veintitres, a prestigious Argentine weekly issued magazine of more than 31,000 copies. Intrepid and provocative as most of their articles, this piece on Bob Frassinetti is no exception to the rule. The local journalist Diego Rojas teamed with Horacio Paone an Argentine photographer to work on this article on occasion of the Buenos Aires Toy Museum show at the British Arts Center to tell the nation the story behind this upcoming and growing cultural project that is Arts + Retro Toys. Born in Buenos Aires Argentina, and having lived all along the globe –from England to Guyana, from Colombia to the Caribbean, to latter reside in Buenos Aires city- Bob tells Diego “When I was a child, my parents didn’t buy me many toys, I used to play with nature and create my own toys… now as a grown up I felt it was pay back time, and currently I owe more than 10,000 toys with are part of my private Argentine made or found toys from 1900s.” Hence the title, making use of good humor and irony…Further on in the article Bob answers to Diego’s question regarding which were his childhood games and toys “We fished in the Caribbean coasts, from small multi-color ones to baby sharks and piranhas. When I was eleven I used to have an owl as a mascot. At that time I had the joy of meeting the Beatles first hand, because they were shooting the movie Help and stayed at my best friend’s house who had rented them a mansion in the Islands”. Bob’s life’s story is amazing, and the experience he gained through his life’s adventures is now being synthesized in his life projects such as BA Toy Museum and Art + Retro Toys shows. He’s a cosmopolite man and takes advantage of his multi culture feel to develop new and intrepid projects. In the world of toy collectibles he has his favorite of all: popular toys, those home-made unique pieces that reflect parental love to their children, home made items produced with handy materials and tons of imagination. To him, these are priceless items of joy and design, which he treasures as solid gold. Bob is an eccentric and joyful collector who has made a life project out of his passions and interests. Upfront and well hearted, this article has been able to capture of Bob and his project’s essence.